GodMode is built into Windows 10, just as it was in previous Windows versions. In fact, its real name is the Windows Master Control Panel shortcut. The folder’s icon will change to an icon as of a Control Panel. Double-click on the new icon to see your universal settings panel. You can name the folder other than “GodMode”; before the Period (.). Now, click the folder, open it and get God-like access to more than 260 functions and tools. Some functions are unique to Windows 10 while others are similar to the previous versions of Windows. 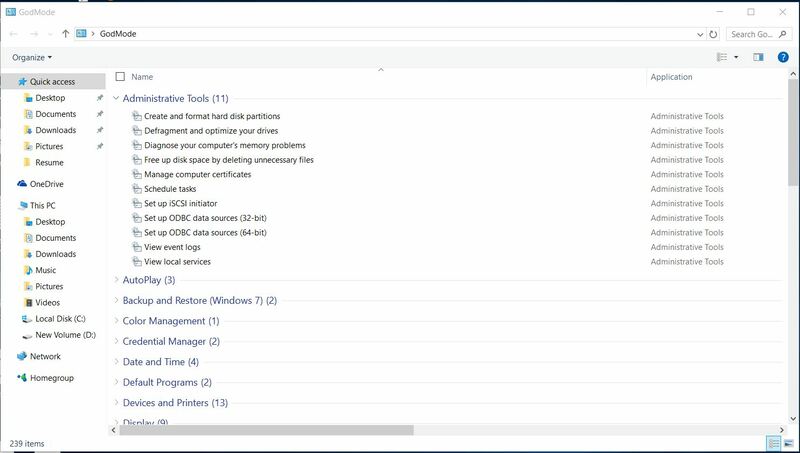 when you open that folder, you can see around 40 different settings, including Devices and Printers, Credential Manager, Indexing, etc. Some variations exist depending if you have a Home or Pro version and different hardware. Note – your system account must have administrative privileges for this folder to work.